Nickelodeon legend and original Double Dare host Marc Summers revealed the very exciting news to ToonZone Forums member @classicnickfan during an appearance to promote his new documentary On Your Marc that, following Nickelodeon's Double Dare revival garnering great ratings, becoming an instant hit with viewers when the new series premiered in June 2018, Nickelodeon has renewed the series, and will be returning to the studio to make more brand-new episodes of Double Dare "in 2019"! It's currently unknown whether the new episodes will be produced as part of the first season, or as part of a second season. Marc also revealed that Nickelodeon's Double Dare Live tour of the US is currently planned to be an annual event until at least 2020! The news follows Red Tail-Live, the producers of the live stage show, announcing that they will be rolling the second leg of the Double Dare Live tour during Spring 2018, which will see the show visit the West side of the USA! Inspired by Nickelodeon's iconic '80s game show of the same name, the new Double Dare TV series is hosted by digital creator and actress Liza Koshy, with original host Marc Summers providing color commentary on the challenges and lending his vast knowledge of the game and expertise to each episode, and sees a new generation of fans compete in the messiest and most physically challenging competition of their lives. The brand-new Double Dare series premiered this summer and ranks in the top three shows with Kids 6-11 on all TV. The series attracted an average of 1.4 million viewers during its premiere week—making it the most-viewed series on kids’ TV this year. 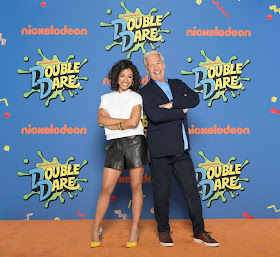 In an indication of the reboot’s multi-generational appeal, Double Dare ranked number one in its timeslot among kids and teens between ages 2 and 14 on both impressions and share, and the Monday, June 25th premiere was Nick’s best series launch among adults 18-49 in more than five years, according to Nielsen. The original Double Dare premiered on Oct. 6, 1986, on Nickelodeon, and ran from 1986-1993, making it the network’s longest running game show. Marc Summers served as the show’s original host from 1986-1993. Shortly after its debut, Double Dare became one of the most popular original daily programs on cable television. The series went into syndication in 1988, and was later revived as Super Sloppy Double Dare in 1989. The show also ran on broadcast television as Family Double Dare in 1988, followed by new versions on Nick, including Double Dare 2000. The US version inspired localised series in the UK (on the BBC) and Australia. On Your Marc, inspired by his 2016 one man play The Life and Slimes of Marc Summers, is a feature length documentary film in which Summers, an Indiana native, looks back on his life and “slimes”. The documentary combines a scrappy, “anything goes” appeal with an informative look at the nature of celebrity. Along the way, Summers reveals how he survived cancer, a recent, near-fatal car crash, and a crippling case of Obsessive Compulsive Disorder (OCD). Full information about the movie can be found at https://www.marcsummersmovie.com/about. Nickelodeon’s Double Dare Live is a multi-city live stage tour inspired by the iconic TV game show Double Dare. Featuring original host Marc Summers and his beloved sidekick Robin Russo, the live stage show will debut in Fayetteville, NC, on October 30 and will tour North America through November. Tickets (including VIP packages) are on sale now. Fans can visit doubledarelivetour.com for a list of upcoming Double Dare Live tour cities, times, ticket information and to to register for a chance to be a contestant on the live show. More Nick: 'All That' Alums Kenan Thompson, Kel Mitchell and Lori Beth Denberg Reuniting to Compete on Special Episode of 'Double Dare'! Follow NickALive! on Twitter, Tumblr, Google+, via RSS, on Instagram, and/or Facebook for the latest Nickelodeon and Double Dare News and Highlights!